What came first the chicken or the egg? Do carrots improve your vision? Oh God… Have you ever heard about stereotypes and myths? They have a great effect on the decision-making running into risks of further consequences. We’ve got the same even while selecting an e-Commerce solution for the online store. Merchants give the ear to the advice of colleges, read the reviews on the Internet and get an unfounded impression about one or other of platforms. However, the variety of shopping carts available on modern digital market anyway restricts the choice to two options: a hosted platform or open source solution. 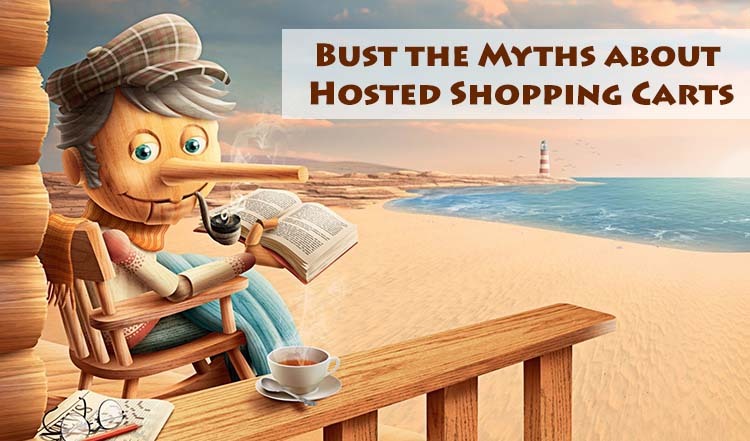 But e-retailers have already created a range of myths regarding the shopping carts. Today, let’s discover what is false and what is true about hosted platforms. Never make decisions based on price as it is going to be your biggest mistake. If you think that selecting open source platforms because it is free, there will be no other considerable costs, then you're absolutely wrong. Open source solutions do not provide a hosting, so it means you need to find it by yourself and, of course, to pay for it. In case something falls out, fixing it appears to be your worry. And again, you’ ll have additional expenses for developer. Also, using open source solutions there is a need to take care of all the upgrade procedures that are not usually an effortless task. Concerning hosted solutions, these costs are included into monthly pricing. Thus, this prejudice is false. Theoretically, open source platforms allow to customize your shopping cart deeply, almost rewriting the core code. But are you able to perform such modifications on your own? If there are some doubts, then customization process has to be delegated to a specialist who works not for free and not in a crack. And how is customization of hosted shopping carts performed? Due to the technical progress of our modern world, public APIs (possessed by most part of hosted solutions) can be used to provide retailers with starling flexibility. As an option, you may also choose from the hundreds of apps which have already built out the changes and functions you are searching for. Are you serious? There is no difference from which solution to perform data transfer as migration procedure looks absolutely the same for both. One of the most effortless can be an automated migration that even doesn’t require technical expertise. So, you need only a few steps to perform for a successful switch to a hosted or any other solution. Cart2Cart is a black-belt migration service to solve this issue. And yes, the statement is false. Not everyone knows that not only open source solutions offer a wide range of plugins on marketplaces, but a purchase of add-ons for a hosted platform also is not a problem at all. Furthermore, it is much easier to create a lasting and secure integration with a hosted platform. It happens because while interaction with the shopping cart, extensions use the solution as the host and defines a set of data. And when it comes to a connection with open source platform, in addition to the variables of the licensed shopping cart, every host has its own data (different versions, rate limits, firewalls, etc). Therefore, everything is vice versa. In case if I were creating my online store for the first time, I would not have even courage to choose an open source solution. And if I had an experience in e-Commerce, I would think twice and make sure I were ready to use all the benefits and accept all cons of open source platform. Cart2Cart offers an easy way to perform the migration to any of 60 supported shopping carts. Check the service functionality with a free test transfer.